They tell me that the worst part of the economic downturn is behind us. Maybe it is, but I just haven’t seen anything that seems to indicate that’s the case. Everybody’s been hit hard, even the lawyers aren’t immune. A lawyer friend of mine told me he was let go from his position at a law firm when his caseload dried up. However, he’s doing OK because he’s now working on a freelance basis with a friend who specializes in bankruptcies, and that’s a category that’s very robust at this time. Advertisers have been feeling the pinch, which has been well documented. Consumer spending is down as families look to save where they can: buying generics, using coupons, and doing more with less. One of the areas where consumers are especially vigilant is in their discretionary spending for family entertainment. A movie night out for four could easily cost $50-$60. And then there’s the matter of the movie’s content. You can see how parents might want to consider an alternative to this. You know, that’s those guys who bust their butts day in and day out trying to make it to the big-time. They have small contracts and play with a zest often missing in major league sports. There’s minor league baseball, hockey, basketball, and arena league football. This is also a perfect opportunity for sponsors to get up close and personal. The cost of sponsoring a minor league franchise is only 20-35% the cost of a major league franchise, and the contract often doesn’t include the constraints that the majors place on participating sponsors. In minor league hockey the promotions could be as basic as sponsoring a fan of the game or allowing one kid to watch the game from the home team’s bench. The sponsor’s brand name is featured on the scoreboard every time the lucky kid is shown, prompting other kids watching in the stands to sign up for the contest the next time. 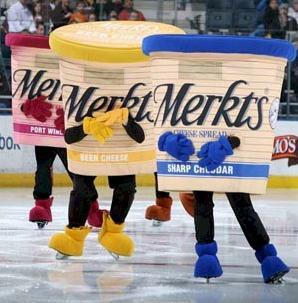 Last year the AHL’s (American Hockey League) Milwaukee Admirals ran a promotion called the Merkt’s Cheese Race, in which several fans dressed in costumes shaped like tubs of the company’s cheese spread. The tubs raced around the rink, mimicking the famed Sausage Race held at Milwaukee Brewers home games. Each racer represented a corresponding section of the arena, and the winner earned fans in his section a coupon for discounted cheese. 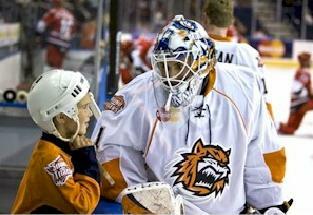 Though in-game promotions are the best way to reach families, most minor league hockey teams also offer uniform advertising, allowing sponsors to place small patches on jerseys or decals on helmets. 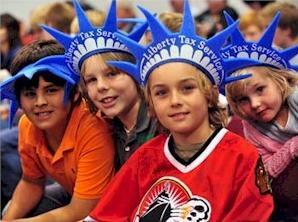 This is also something their NHL brethren do not allow. These are examples of companies that realize that their customers are local and want to establish a strong connection with them in the form of entertainment. This isn’t the Super Bowl and its $3MM commercial price tag. It’s not MLB or the NCAA. It’s just good, old, clean fun that happens to be local. Clearly, the folks at Chase, or their agency, have forgotten the fundamentals of advertising. Let’s review the basics, shall we? 1. Don’t believe everything you think. Just because your brand is a market leader in one part of the country doesn’t mean this will automatically translate to success elsewhere just by announcing your arrival. You still have to differentiate yourselves, and let people know what you stand for that is different from the next guy. 2. Make it count. With so many options for consumers these days, people need to know why it benefits them to do business with you. Take the time to figure out how to translate what you do, what you stand for and what you offer into something meaningful, compelling and relevant to your target. Otherwise, it’s wasted ad dollars.